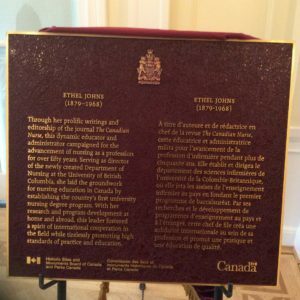 Ethel Johns, first Director of the UBC School of Nursing, has been honored by the Historic Sites and Monuments Board of Canada, Parks Canada, as a “Person of National Historic Significance”. Johns is one of a very few nurses that have been so honoured. The bronze plaque will likely be mounted in the patient park near the Koerner Acute Care Hospital Pavilion, which now houses the UBC School of Nursing. Many thanks to BCHNS members Glennis Zilm and Nan Martin who have worked tirelessly and diligently with Parks Canada for many years to see this recognition happen.